Srinagar, Apr 16 (KNS): Hurriyat Conference (G) chairman, Syed Ali Geelani while commenting over the statements of Gen Bipin Rawat and State Police Chief Dr S P Vaid, on Monday said that virtually they have admitted that through arbitrary measures and unabated killings India couldn’t break the resolve of Kashmiri people. Geelani while referring to statement of Bipin Rawat, wherein he has said that’’ neither forces nor militants will achieve their goal’’, added that his assertions are ambiguous and portray only distorted form of events. 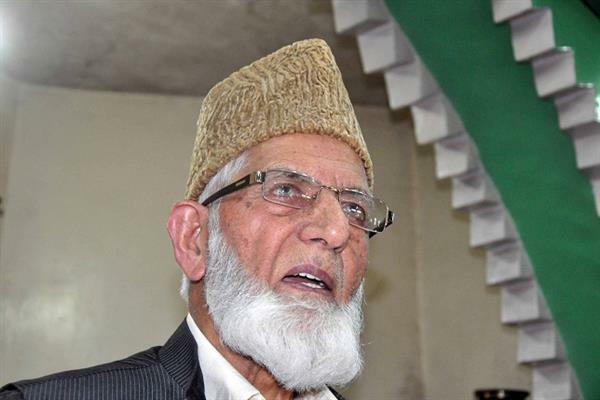 Hailing sacrifices rendered by nation, Geelani in a statement issued to KNS said that “their statements, confirm our moral victory and illustrates that nation has upper hand,” saying it is a victory mark for my suppressed and oppressed people. “Gen Rawat need to visit annals of Kashmir history,” Geelani suggested, saying that it is absurd to say that people of Kashmir favor India, instead the Indian military is engaged in a war against innocent civilians in every nook and corner of the state. “It testifies our claim that Indian authorities are living in an illusion and believe in military might,” he said. “Don’t tinker or misquote history,” Geelani insisted, saying that distortion of events and facts can never change narrative. “Misinterpretation of facts can never suppress or subdue aspirations and ambitions of people,” he added. “Army chief should convey New Delhi that people in Kashmir are firm and determined to follow their sacred freedom struggle, despite all odds and won’t succumb to state sponsored pressure, nor they will leave their goal midway or unaccomplished,” he said, adding that it is their power of arrogance, saying India with its all military might is occupying the state. Rejecting the statement of Army chief, Geelani said that it is a brazen lie, saying that referendum is the only yardstick that can validate and confirm people’s aspiration about their political destiny and it will clear which way the wind blows. Meanwhile, Geelani expressed deep grief over the demise of the veteran Jamaat e Islami leader Gh Mohammad Khirqa (Char e Shareef). Hailing his contribution for Kashmir freedom movement, Geelani expressed heartfelt condolences and solidarity with the bereaved family of late Khirqa and paid his tributes. He also prayed for eternal peace to the departed soul and forbearance to the bereaved family to bear the irreparable loss. Meanwhile, Hurriyat spokesman denounced “continuous night” raids by forces and “arbitrary” arrests of youth in the length and breadth of Kashmir. “During night raids in Baginder, Mohan pora and Narkerah Budgam, fresh arrests of innocent civilians and putting them in police stations and jails, ransacking houses, breaking doors and window panes, creating a fear in the entire area was a ploy of the ruling class to suppress the sentiments, wishes and aspirations of the people,” the statement added. “Hurriyat strongly condemns the ruling regime and its police force for their inhuman and vengeful attitude towards the youth and children, saying these tactics were being used as a political vendetta against our youth," spokesman said. Hurriyat denounced the detention of 17-year-old student, Sajid Ahmad Bangroo in Bagander Mohanpora and added that he was subjected to physical torture and even his father Mohd Shafi Bangroo was arrested during raids and police authorities are needlessly chasing another son Aadil Ahmad.